Joe Cornell, 52, was working in the lot of a Salvation Army location as part of a substance abuse rehabilitation program when he saw a bag of cash fall out of the back of a Brinks armored cash transport car as it drove over railroad tracks in downtown Fresno. He sent it back – because he was afraid of the police state. This entry was posted in and tagged armored car, armored truck, bag of cashm ethics, Brinks, cameras, Capitalism, Fresno, Joe Cornell, NSA, reward, Sacramento, surveillance state on June 9, 2014 by Ted Rall. Anything can be a point of pride. Your local baseball team. The weather. Political corruption. The genesis of today’s cartoon is a barroom argument I found myself having at least 20 years ago with a Chicagoan. “The Illinois state legislature,” he stated confidently, “is the most corrupt in the country.” I made cases for my home state of Ohio and my adopted home of New York. Overhearing us, a third man approached, loaded for bear, to make clear that anyone who challenged Harrisburg, home of Pennsylvania’s state house, as the stinkiest cesspool in all of American politics would have to deal with him and his voluminous knowledge of the Keystone State’s seemingly infinite list of dirty deeds. There was never any doubt that this week’s piece would be about Leland Yee, the pro-gun control state senator accused of attempted arms smuggling. As they say, you can’t make these things up. To think that people still ask me where I get my ideas! “[Yee] held press conferences denouncing violent video games and helped pass legislation in California prohibiting sales of such games to minors. And yet, secretly, he was living the life of a Grand Theft Auto character,” Scott Shackford writes in Reason. Me, I thought Walter White from “Breaking Bad.” Whatever. Hand slaps forehead, jaw drops. But how do you cartoon a story whose central character is itself a cartoon? Exaggeration isn’t possible; it’s already too extreme. You can go with straightforward editorializing. 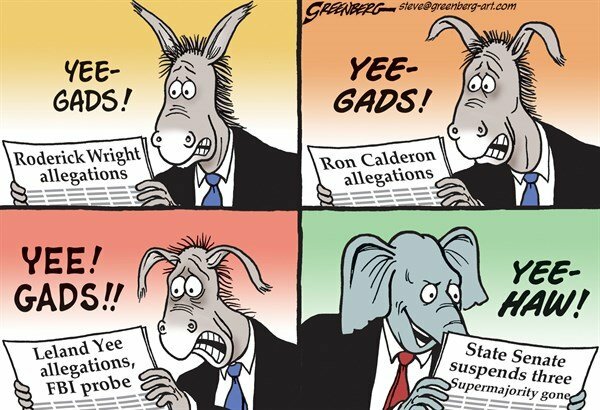 “Isn’t it just awful.” “One more reason people don’t trust politicians.” “What a hypocrite.” Trouble is, the ballpeen hammer to the skull approach disproves the cliché that “it’s funny because it’s true.” It’s true — Yee’s alleged misdeeds are awful and do nothing to help citizens feel good about government ­ — but it’s not funny. Nor interesting. Instead I approached this story through the back door. Inspired by having recently watched the finale of “Breaking Bad,” a show in which viewers are simultaneously appalled by and admiring of a criminal character, I decided to turn the perspective around. Rather than single out Yee as a bad apple (whom, thanks to the FBI, we can feel happy has been extracted from the newly virtuous political gathering in Sacramento), I depict his corrupt colleagues bemoaning their own lack of ambition and scope compared to Yee’s staggeringly over-the-top perfidy. Given the string of recent scandals out of the state capital, from Roy Ashburn (the gay state senator who voted against gay rights, arrested for DUI) to Michael Duvall (the family values conservative caught bragging about his affairs over an open mic), Yee’s arrest does not likely signal a 99-44/100ths pure state assembly. It makes a bigger point about a more important issue. With a little luck, it might even make you laugh. Appeared originally at The Los Angeles Times. This entry was posted in Blog and tagged arms dealer, California New, egos, FBI, gangster, Leland Yee, Local Cartoon, los angeles times, Sacramento, State Senate, Sting Operation on April 3, 2014 by Ted Rall. This entry was posted in Blog and tagged arms dealer, California, egos, FBI, gangster, Leland Yee, Local Cartoon, los angeles times, Sacramento, State Senate, Sting Operation on April 3, 2014 by Ted Rall.